The Resident Evil franchise has been a bit hit and miss at the best of times, the hit factor was certainly more of a surprise than the miss. For my part, the first film was great entertainment, the second was a massive let down, the third surprisingly better than the second and Afterlife was the best of the sequels thus far. It was the latter film that gave some hope for its continuation in this 5th installment. 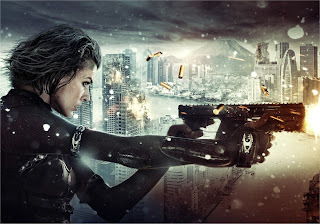 Paul W.S Anderson returns as both writer and director, his wife Milla Jovovich also returns as seminal hero Alice as do a number of the cast from the previous sequels, but a little more on that later. The film starts with a wonderful slow motion action scene depicting in reverse the events on the Arcadia up until the end of the last film We are then treated to the same scene moving forward in real time, a scene that will see Alice get blown off the Arcadia and into the sea. She awakens as a wife and mother in a suburban environment in which the world seems normal, normal that is until a zombie attack occurs! During her escape from the zombie imposters, her husband Todd (Oded Fehr - who is in fact Carlos Olivera from the third film) is killed and she bumps into Rain (Michelle Rodriguez from the first film) with whom she continues her escape, albeit a short attempt as they soon crash and get knocked unconscious. OK, the real shame about this installment is the potential this film had to be brilliant! We learn that Umbrella have created a massive testing facility in the arctic circle that contains minutely detailed recreations of Tokyo, New York, Moscow and Racoon City for the purposes of testing the impact and spread of the T-Virus. How awesome would it have been to simply make one or all of the previous films simply a simulation!! The potential was there and only lightly touched on using the Tokyo opening from the previous film. We have bascially all of the major characters from the previous films returning with only the simple explanation of them being clones (something we previously only knew about Alice). This strengthened the idea that the first or second films could simply have existed as a mere figment of a clones life.